For decades, no one who visited Squash’s failed to meet — and like — Katherine "Cookie" Casagrande. 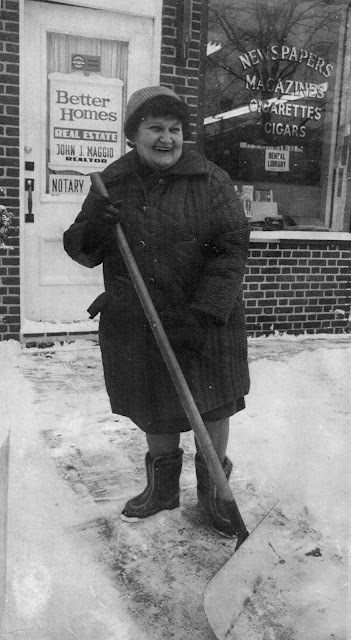 She always wore a happy face — even clearing snow! Many Ridgefielders also knew her from her working in the cafeterias of the Ridgefield schools. Mrs. Casagrande and her husband, Pete, were both lifelong residents of Ridgefield, where they met, married and raised a family. They enjoyed both traveling and golf — and played golf together in every one of the original 48 states! Mrs. Casagrande was born on Jan. 1, 1924, a daughter of Harold and Alice Harding Finch — both Finch Drive and Harding Drive are named for her families. Her father had owned the United Cigar Store on Main Street, predecessor of Squash’s. Cookie grew up in a house on Catoonah Street and graduated from Ridgefield High School in 1942. Fifty years later, she and Pete decided to retire to a warmer climate in Summerfield, Fla., where they had a house next to, what else?, a golf course. Pete died in 2004 and Cookie six years later.